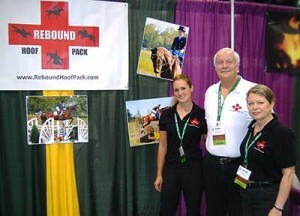 Kehoe Enterprises, LLC, manufactures Rebound Hoof Pack in Purcellville, Virginia, and distributes through online companies and retailers in the U.S., Canada, U.K. and U.A.E. It was invented and is patented by an Advanced Three-day Event Rider and trainer, Ashley Kehoe. She sends a huge thank you to Dr. Jeffery Beshear of Old Dominion Equine and Zeb Foltz (& team) of Forging Ahead Farriers in Virginia, who gave their valuable input when Rebound Hoof Pack was just her Entrepreneurial project while a business major at James Madison University. Another huge thank you goes to her trainers, at the time, Olympic medalists, Karen and David O’Connor, and their groom, Max Corcoran, who were the first to test Ashley’s new product and they loved it. Word spread from there and it is still mostly known through good horse people “sharing”. With Rebound Hoof Pack there is finally a better way to keep your horses sound after a hard workout, no matter what your horse’s job is: racing on a track, jumping, cross country galloping,fox hunting, barrel racing, driving, etc. Simply take one minute and pack those hooves! Below is a video made by the American Farrier’s Journal of our booth at the annual International Hoof Care Summit in Cincinnati, Ohio.